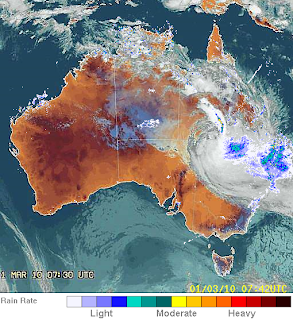 Will Qld see it's last cyclone for the season? Will autumn storms pack any punch in 2010? Gold Coast gets drenched, but not as wet as some! It's beginning to look like the south-east corner is going to get a pounding, with the Bureau of Meteorology issuing a second Severe Weather Warning at 4:35pm specifically for the South-East coast district and Wide Bay Burnett districts for flash flooding and damaging winds tonight and tomorrow. It has also issued a Coastal Wind Warning at 3:10pm for 25/30 knot winds expected to develop early Tuesday morning. Heavy rain is expected to cause localised flash flooding, with most rivers and creeks already saturated from previous rain. There have been reports of up to 200mm of rain falling in western Queensland with rapid stream and river rises. Additionally, an east coast low is expected to develop near Fraser Island overnight into Tuesday morning causing freshening SE winds near the coast. Damaging wind gusts of up to 100kmh are expected in coastal areas and island communities during Tuesday. You may remember our last major east coast low on May 20th last year that produced heavy rain and strong winds resulting in flooding and storm damage around the Gold Coast, with a man killed by flying debris in Surfers Paradise whilst he sat in his office (link courtesy of Emergency Management Australia). Contact the SES on 132 500 for emergency assistance if required.